Art may be entwined with religion, encompassing a spiritual message beyond artistic form and design. The thangka is one such sacred art in this world. Each thangka is created for a specific purpose and will always be different from other ones. It is for this reason and other values that they are conserved for the present and the future. The thangka poses complex challenges for conservators because of its composite nature and the wealth of values it embodies. It demands a balanced approach that looks into its material and conceptual integrity. Each of us has different aesthetic standards in interpretation of the thangka. This research explores the approaches and perspectives of thangka conservation, in particular embroidered/ appliqué thangkas and the influence of their significance in the decision-making process of their conservation. Through this investigation, the author establishes a framework of decision-making and her perspectives to thangka conservation. Much of the cultural heritage we appreciate today has existed through generations of preservation efforts. Oral traditions, literature, monuments, sculpture and paintings, were, and still are, a source of enjoyment that provide lessons in history, religion and art (Unesco 1975). In all forms of artistic activity, the works of art produced have a special significance and purpose. Shadow puppets, for instance, were used in countries like India to teach spiritual values and to relate in an interesting manner the great epics, such as the Ramayana (Unesco 1975). Paintings are also used to illustrate literature, poetry, history, and so on (Unesco 1975). Art may also be entwined with the propagation of teachings, encompassing a spiritual message beyond the artistic form and design. The thangka is one such sacred art. The very act of its creation is a form of meditation. The artists do not consider themselves creators, but produce thangkas as a mission, an act of worship. Art not for art's sake, but for a deep spiritual purpose (Mehra 1970; Shaftel 1993; Unesco 1975). In past and present times, the thangka has embodied a wealth of values, not only religious and artistic values. Significance bestowed upon the same thangka will vary in different cultures, geographic locations, and periods of history. It is for these different values that thangkas have been conserved, for the present and the future. This research has been done as a contribution to facilitate the conservation of thangkas. It investigates their material and conceptual integrity through the studies of their history, making and significance. The research then moves on to the exploration of the approaches and perspectives of thangka conservation, in particular embroidered/appliqué thangkas and the influence of their significance in the decision making for their conservation. Through this investigation, the author establishes a framework of decision making and her perspectives and approaches to thangka conservation. Textile has been used for various purposes for generations – one of which is as a support for various types of paintings. Thangkas fall into this category (Gupta 1994). The thangka (tanka, t'anka, tang-ka or thang-kha, Tibetan Thang-Ka, Thang-Sku, or Sku- Thang) is Tibetan religious scroll art (Unesco 1975). It is mostly known in the form of painting or embroidery on woven material, usually cotton. Its name denotes "something rolled up" but it has also been suggested that its name is derived from the Tibetan thang yig meaning annal or written record (Britannica, Shaftel 1986). Due to the vulnerable nature of the material, not much is known of the early history of thangkas. It is also difficult to place them in a precise context or establish their chronology because the mountings have often been replaced and may have originated from different periods or areas than the central picture. Furthermore, most thangkas are unsigned, undated, and executed in close adherence to tradition (Loeshka 1992; Oberlin 2000; Shaftel 1998). Nevertheless, scholars like Tucci have unravelled their history and importance (Agrawal 1984; Unesco 1975; Vestergaard 1996). There is no doubt that the history of Tibetan art and thangkas were closely associated with the history of religious developments, because they were intended to be functional art. Some sources say that the tradition of thangka painting in Tibet is from the Gupta period of 330-520 A.D. (Gupta 1994). In Tibet, the earliest examples were dated back to the 9th or 10th centuries. Other sources indicate that thangka paintings were known in Tibet in the 13th century. In Mongolia, they were first produced and used at the beginning of the 17th century. The thangka is derived from Indian cloth paintings (patas), from mandalas, originally drawn on the ground for each ritual use, and from scrolls used by storytellers. In technique and style, it closely resembles the Indian pata. Its painting draws inspiration from Central Asia, Nepali and Kashmiri and its landscape has been influenced by Chinese art. Thangkas are painted according to exact canonical rules. Their subject matter provide a wealth of understanding of the Tibetan religion. They commonly depict the Buddha surrounded by deities or lamas and scenes from His life; divinities assembled along the branches of a cosmic tree; the wheel of life (Sanskrit bhavacakra), horoscopes, etc. (The New Encyclopaedia Britannica 1983). Thangkas are more than two-dimensional images, literally and symbolically. They are always meant to be mounted and seen as three-dimensional constructs. The raised cover, the ribbons, and the finials of the bottom rod all contribute to this effect. In the religious context, thangkas were essentially aids for meditation, a symbol of spiritual thoughts (Agrawal 1984; Mehra 1970; Singh et al. 1992). They were commissioned for both spiritual and mundane matters. Perhaps dedicated to a sick person, or to remove spiritual or physical obstacles to a particular end, or to help a deceased person receives a happier rebirth. They were also commissioned for special religious occasions to help the donor to gain merit (Leoshko 1992). Sacred art has always been and remains one of the most popular and beloved aspects of the life of the Tibetan people because they are embodiments of enlightenment. For centuries, thangkas have fascinated neighbouring countries and beyond. The American Museum of Natural History has some three hundred thangkas (Williamson 1983). There are established collections in the Asian Art Museum of San Francisco, Boston Museum of Fine Arts, and the Horniman Museum (Loeshko 1992). The Tawang Monastery in Arunachal Pradesh is said to have about 1500 thangkas, which are about three hundred years old (Singh 1992). The dpar ma, block printed thangka that is produced on a canvas. The outline of the Wheel of Life is printed with a wood engraving before painting. It is said to simplify the painting process and gives special effects. The metal thangka, whose durability and foldable concept was to serve travelling needs. The paper mache thangka. Its uniqueness is the three-dimensional appearance of the central picture. The tshen drub ma, embroidered thangka. It was said to have been executed in the far eastern part of Tibet and China to be exported. The woven thangka. It has been proposed that very few thangka-painting artists remained in Tibet during the Chinese occupation of Tibet. Thus this kind of thangka was made so that Tibetans could have a thangka for the family altar. The dras-drab-ma, gos-sku, appliqué thangka. It consists of many single pieces of cloth (Dharmapala Centre). The embroidered/appliqué thangkas will be the main subject of this research. Applique thangka is a particularly Tibetan style, according to pre-17thcentury texts. Fragments of coloured cloth – most often silks, traditionally imported from China or India – are cut into desired shapes and arranged to form a kind of mosaic. The pieces are either sewn onto a background or to each other. Of Chinese origin, this technique is widely practiced in Tibet, Mongolia and other Himalayan countries. It is known that appliqué work was initiated by the great king Sontsen Gampo, in the 7th century CE and was later developed into a sacred art. The main reason for initiating this technique was that it was more durable than the painted thangkas, especially when moved around. At one time it was mainly used as a personal object of meditation (Nechung Foundation). Since embroidered thangkas were costly to produce, they were a rarity and were therefore favoured as imperial tributes and trade goods. Only a wealthy individual, monastery, or the Chinese Imperial government could have afforded to commission them. In Tibet, it is likely that the ordinary people would have been unaware of their existence (Bacchus 1999). Another proposition to its history is that it has been customary in Buddhist practice to make valuable offerings in order to increase merit and to receive blessings from God. So it seemed only natural that silk, a highly valued material in Tibet and the Himalayan region, became an appropriate offering material and was used to create religious images. Other sources indicated that the use of embroidery to create thangkas dates from the 13th century. These were images woven and embroidered in China and given as gifts to Tibetan rulers. They were a combination of Tibetan artistic style and Chinese textile techniques. In the 15th century, Tibetans made the first fabric thangka, utilizing indigenous appliqué techniques. The appliqué and embroidered thangkas grew in popularity the 18th and 19th centuries and spread throughout the Tibetan Buddhist region. Such was its popularity that most monasteries had their own sewing workshops and a collection of treasured appliqué thangkas. This sort of thangka was especially suited for making very large thangkas. Such huge images were made by groups of men and women under the direction of a master tailor and /or master thangka painter. In Mongolia, the stitching work was largely performed by women, whereas in Bhutan and Tibet, it was done almost exclusively by men (Wongmo 1999). The image is created from a template line drawing, on cloth or paper, that is made according to strict proportions and passed down for centuries. The use of a template is important for passing down the spiritual value and efficacy of the image. From this template, distinctly coloured areas are formed using several colours of silk. The silk is hand loomed and dyed in Varanasi, India, by family businesses which have been trading with the Tibetans for generations. Silk pieces are then placed like a jigsaw puzzle, using the drawing as a guide; glued and carefully handstitched together (sometimes a background cloth, also). The outlines are defined by cords of leather, yak, or horsetail hair, mixed with threads of gold, hand wrapped with silk thread and couched on the silk along the precisely drawn lines. Because the thread for stitching and wound around the cords is the same, it hides the seams. Certain details, such as the eyes, are embroidered or even painted on. The eyes are considered to be the most difficult aspect of the work and traditionally the last skill imparted after years of apprenticeship. They are embroidered in a distinct spiral pattern, creating a realistic effect (Wongmo 1999). The completed picture is framed and mounted in a silk brocade border similar to those of painted thangkas. It supports the finished work and is a wealth of symbolism integral to the complete thangka. In Tibetan, the mounting is called tang-kahi-gos-sam (the silk of the surface). Each part contributes a specific meaning to the assembly. Table 1 shows the essential parts of a thangka. and 2 ribbons Picture cover or cover of respect Shields the painting from the eyes of disrespectful viewers as well as smoke, oil and dirt. The cover hangs over the thangka and the ribbons hang over the cover. The ends of the ribbons are weighted with small quantities of sand to keep the veil straight and immobile. The rolled up cover is held in position by the ribbons, which are wound round it. The ribbons also serve to tie the scroll when it is stored. Stitching assembles these different parts of the thangka. Usually the border would have a stitched lining, but the central picture would not, since an inscription of some ritual words or religious formulae, in black, red or gold, tends to be placed there – a lining would obscure it. The inscription forms part of the consecration of the thangka. Thereafter it becomes alive as a dwelling of their God. Hence, without the religious inscription, the thangka does not have religious significance or value in the Tibetan culture (Agrawal 1984; Unesco 1975). In Tibet, this highly regarded skill of thangka making has traditionally been passed on from senior monks who study the art, to the younger generation of monks, so that this rich, historic tradition will never be broken. The Nechung Monastery is one of the monasteries that has kept on this tradition. In Tibet, both monks and laymen can engage in this activity and it is believed to be a practice that has always been in existence. But it was not so in Nepal. In the past, thangka making was the preserve of the Newars, the original inhabitants of the Kathmandu Valley. Therefore it can be said that in the past, only certain people were allowed to partake in this activity. In modern times, however, thangka making is no longer the preserve of the originators. This is likely due to the change in patronage of thangkas and the decision to impart the knowledge to more people to keep alive this sacred tradition. The change in patronage has been identified as the increased demand for thangkas in the tourism market in comparison to religious patronage. This has led to the establishment of many art studios that produce thangkas for commercial purposes. Some of these studios are in the Kathmandu Valley, Nepal. One of which is the Dharmapala Centre P. (Ltd). In this centre, commissioned thangkas have been created under the supervision of the lama of the Nyingma order (Dharmapala Centre). Unfortunately, not all artists work in places such as the Dharmapala Centre or have had the training in traditional thangka making methods. They have therefore created a concern about the commercialisation of thangkas, which are often poorly executed and have incorrect iconography. If the situation persists, the worry is that the sacred meaning and purpose of thangkas will be lost. In response to this, schools like The Tsering Art School are built to contribute to the preservation and restoration of Tibetan Buddhist Art and to provide opportunity to acquire the knowledge and skill of thangka making (Alsop 1992, Dharmapala Centre). Specific cultural context bestows upon objects their significance. These meanings are attributed to the values they embody. It is for these values that thngkas are conserved, for the present and the future. Each new thangka is created for a specific purpose. This purpose will be its original significance and value and the very reason it will always be different from the other thangkas. The next section is a glimpse of the wealth of significance the thangkas actually embody. It will be clear that it is impossible to assign a single value to a thangka (Batton 1992). The silk borders of thangkas have their own iconography and symbolism. They possess a mystical significance that cannot be ignored (Huntington 1970; Unesco 1975). They represent the traditional and religious value of the thangkas. The mountings that are detached have values in themselves as unique historic and artistic textile objects. They may be fine examples of weaving, silk, dyes, construction, style etc. They are therefore of important value in the study of ancient Chinese textile technology. The study of the silk mounting may also have historic value, as it reveals information on the identity of the artist and original context (Oberlin 2000; Shaftel 1998). Unfortunately the borders have been placed in lower priority to the central picture, not only in scholarly research but in terms of value. In most publications, borders have been omitted, even if they exist. The thangka is rich in religious and cultural values. Hung in the monastery and family altars, it is a symbol of religious thought and a means of attaining salvation. Some thangkas were commissioned for reasons including dedication to a sick person and help for a deceased one to receive a good rebirth or to remove a particular spiritual obstacle to a particular goal. It plays a vital part in religious ceremonies as it invokes the divine spirit and creates a divine atmosphere. It is an aid to worship and meditation. They can be carried in religious processions or used to illustrate sermons. Thangkas were also widely used in monastery school as teaching tools because of their convenient movability. Believers also hung them in homes as protection against evil spirits. The thangka, which was worshipped in the past, often contains ritual offerings or inscriptions on the back of the main deity. Silver foil, coloured rice and long strips of manuscripts are some items that have been found during conservation treatments (Agrawal 1984; Singh et al. 1992; Bacchus 1999; Gupta 1994; Mehra 1970; Unesco 1975). A thangka is rarely the expression of the vision or the creativity of the artist. Thangka making was regarded as a means to purify and improve the human mind. For that reason thangka creators have generally remained anonymous, as have the mountmakers (Mehra 1970; Shaftel 1993; Unesco 1975). They can be valuable, historic testimonies. A thangka, for instance, was presented to W. W. Rockhill, a Tibetan scholar who was at that time U.S. Minister to China, with the inscription 'presented to me by the Dalai Lama/Wu-tai-shan/June 21st, 1908. W. W. Rockhill.' Rockhill met with the 13th Dalai Lama at Wu-tai-shan, a sacred Buddhist mountain in northern China, during the Dalai Lama's exile to Mongolia (1904-1909). This significant thangka has led historians to believe that it was probably the first contact between Tibet and the United States (Meinheit 2000). A 7th-century thangka embroidered with pearls that shows the goddess "Green Tara" is another historical thangka. It is located in a Tibetan monastery in the Yarlung Valley. The historical value attached to this thangka can be said to be its creator, who was said to be the Chinese princess Weng Chen, who was married by the Tibetan King Tson Tsen Gampo in the year 641 (Dharmapala Centre). The thangka has added significance because its creator was a royalty in the history of China. From the early 17th century until 1907, Bhutan practiced a dual system of administration whereby a spiritual leader ruled the clergy and a temporal ruler took charge of the affairs of the state. A Bhutanese inscription on a paper tag attached to the work identifies the central image as Shakya Gyaltsen (1813-75), who was twice head abbot of Bhutan, in 1865-69 and again in 1875. This thangka is thus not only a beautiful work of art but also an important historic document reflecting Bhutan's unique system of government (Tse 1999). Thangkas are cultural legacies, and cultural property in the broadest sense belongs to humanity. It is not exclusive to where it inhabits – all of us are connected to it in a mysterious way. It is this strange connection that has sent cultural exchanges to several parts of the globe, through the web, travelling exhibitions, and documentaries in order to reach as many people as possible. It gives us insights into the traditions, the perspectives, the history, and the expertise of another culture. It educates us, enriches our lives and is our link to the past (Jensen 2000). Some important thangkas are displayed only on special occasions (Unesco 1975). In the religious land of Ladakh a huge thangka is ritually displayed every 12 years during the festival of the Hemis Gompa, dedicated to Lord Padmasambhava. Thangkas as such will also have continued use value (Shubhyatra). Their incredible size and intricate design make them important treasures as well. Besides religion, the contents of thangkas are about history and folk customs. So they are considered a Tibetan encyclopaedia as well. There are medical thangkas that illustrate how the nerves interact with the body, the body's internal organs, and much more. Some thangkas also have emotional value. An example is the following thangka, commissioned in memory of a loved one. This appliqué thangka was made by the order of the 8th Dalai Lama to honour the memory of his teacher in 1768. Depicted in the central picture is both the portrait of the Dalai Lama and his teacher and a dedicatory poem. The significance is not merely the portrayal of sentimentality. The poem throws light on the esteem of a student for his teacher and the concerns of the Dalai Lama for the troubles of his country. Together they provide a secure date for the work and is a testimony to the history of Tibet (Pal). Thangkas are therefore not merely for decorative purposes. Although they may be commissioned for different reasons, in different epochs, they will always relate to each other because they are links to the originating culture. The thangka poses complex challenges for conservators due to its composite nature and the wealth of values it embodies. It demands a balanced approach that looks into its material and conceptual integrity. Each of us has different aesthetic standards and interpretation of the thangka. It is therefore understandable and predictable that in different parts of the world, there exist different perspectives and approaches to its conservation (Unesco 1975; Van Der Leeden 1972). Nowadays, Asian countries are influenced by the Western philosophy of conservation, such as the code of ethics of the American Institute of Conservation and International Council of Museums (ICOM). The conservation problems to be solved and the survival of thangkas will depend upon whether effective and appropriate solutions are found through this cross fertilisation of philosophies and approaches (Unesco 1975). To investigate the perspectives and approaches to thangka conservation, the author first located related published papers using conservation databases, namely the Canadian Heritage Information Network and Conservation Online. But in order to get a broad perspective of thangka conservation, it was felt to be important to also study treatments that were not published and reflected current thinking. Some of the authors of published literature were therefore contacted. Internet search engines were also used to find holdings of thangka collection. Institutional holdings, representing different regions in the world were then contacted by electronic mail and enquired on their experiences. The study and analysis of these case studies (see Appendix) highlighted that some of the issues of concern (perspectives) were significance, context, stakeholders, time, and condition and causes of damage. The conservation of thangkas challenges the conservator to derive treatments that not only consider its material integrity but its significance as well. The treatment should aim to regain any diminished significance, to enhance significance but not to compromise it (Kronkright 1993; Shaftel 1991). It is also important to recognise that no one thangka will embody the same significance. Some thangkas are significant because of their religious value. For others it could be emotional or cultural value or a range of these three types of values. It is therefore important to identify the significance because it will influence the treatment. A thangka that was presented as an official gift has to be interpreted and treated differently from one that was created for religious purposes. The context and role of the thangka affects its interpretation and the decision making in conservation. There has not been and there may never be a treatment that enables an object to deal with various context and roles. Thangkas have been found in contexts including museum displays, study collections, private usage, and monastic ritual usage. A thangka in a museum and a thangka in a monastery have to be treated differently because their functions are different and therefore they will have different conservation needs. A thangka in an art gallery and its counterpart in an ethnographic museum will be treated differently for reasons such as dissimilar museum policies. In an art gallery, for instance, thangkas are often treated as paintings and the focus is only the central picture. Although there is no consensus on presentation, the displays have been in settings that are sensitive to their original states. These displays have included creating reliquary niche and recreating the interior of a Tibetan monastery in the galleries. Treatment must therefore be specific to their contextual needs (Blyth-Hill 1992; Cussell 1998; Eastop 1998; Ennes 2001; Kronkright 1993; Orlofsky and Trupin 1993; Pye 2001; Shaftel 2001). Stakeholders have an important role in the conservation of thangkas. In a museum context, originators, curators, designers, and conservators often have different interpretation of the thangka. Each of them is likely to appreciate it differently and want to bring out that aspect of the thangka that he/she feels is significant. No doubt this leads to a conflict of interests, but this should not be avoided. It is through communication and collaboration that appropriate and informed decision can be made for treatment and display. In this way, a holistic view of the thangka may be achieved and the Tibetan culture will be better interpreted and appreciated (Caple 2000; Loeshka 1992; Mellor 1992; Pye 2001; Reedy 1992). It is also important that conservators and curators discuss conservation treatments. Informed decisions are essential to ensure that the treatment is not detrimental nor inappropriate. Each conservation treatment is a new chapter in the life history of the thangka and hence should be thoroughly thought through and thoroughly documented (Blyth-Hill 1992). Time waits for no man. In Tibet, it is the race against time to preserve its heritage at risk of being lost as rebuilding of damaged monasteries goes on. The conservation operation is slowed down by the lack of knowledge of modern conservation techniques. To tackle this problem, conservators have been brought into Tibet both to assist in the operation as well as to impart conservation knowledge to the people (Asian Art a, Shang-Shung). In the museum context, conservators also contend with deterioration that accelerates with time of neglect. But the other major race would be to prepare the thangka to meet exhibition needs, study demands and so on, within a tight schedule. Thangkas are susceptible to deterioration caused by inherent vice, mechanical, chemical, environmental and pest damage, past use, and treatments. Its vulnerability is compounded by its composite nature since each material reacts differently and a treatment has to consider the interaction of these factors (Agrawal 1984; Bruce-Gardner 1988; Mehra 1970; Shaftel 1991). Inherent vice refers to natural deterioration due to material composition and/or construction. For the thangka, its organic nature – the textile fibres particularly – acts against its survival. The most susceptible element is silk. It is rapidly weakened by dampness, which explains its deteriorated state if it has been hung on the damp walls of a monastery (see Water). In severe situations, it becomes desiccated, brittle, and powdery. Another causative factor is the loss of or damage to warp threads. Silk damask warps are known to be finer than the weft and therefore have limited capacity to withstand the tension of the weave. Hence when hung for long periods of time, the weaves disintegrate, exposing loose weft threads and causing weave distortion. Therefore the implications of material vice include the weakening of fabric components and losses (Foskett 1994; Mehra 1970; Rothwarf 1984; Shaftel 1991). The situation is further aggravated by thangka construction. The weight difference between the central picture and the borders, and the weight of the heavy bottom rod, means tension from all directions. Repeated rolling and unrolling further enhance the extent of fractures. Thangkas are constructed through stitching but these are potential areas of weakness because the fabric is pierced and compressed. And when stitching threads degrade more rapidly than the fabric the overall fragility in the structure is increased. The borders are usually the first to fail, as the borders get separated from each other and from the central picture. Therefore losses in borders are common and original borders are rare. The upper borders are usually at highest risk (Agrawal 1984; Bacchus 1999; Blyth-Hill 1992; Gupta 1994; Foskett 1994; Rothwarf 1984; Unesco 1975). The creasing in the lining has been observed as well. The main cause has been suggested to be that the dimension of the lining being greater than the thangka, which may be the original concept of thangka construction (Bacchus 1999; Foskett 1994; Rothwarf 1984). Besides inherent vice, display conditions can be culprits. It is known that when on display in their original Tibetan settings, thangkas were exposed to soot and airborne debris from burning butter lamps and incense. Sometimes butter or oil was spread over the painted thangka to preserve it. Eventually, the accumulation of dirt and grease will darken the surface and obliterate the image and the colours beneath. Besides being difficult to remove, their presence in the fibres accelerate fibre degradation (Agrawal 1984; Blyth-Hill 1992; Mehra 1970; Rothwarf 1984; Shaftel 1986; Unesco 1975). Water is another enemy of thangkas. The source of water could be relative humidity, water in the walls, sprinkled holy water, or in the adhesive materials used in the treatment. Water damage may show up as bleeding of colours, leaving tide lines. In addition the response of the different materials to changes in relative humidity cause dimensional stresses and distortion (Blyth-Hill 1992; Shaftel 1986). Light destroys thangkas through chemical and physical alteration. The ultraviolet in light hastens fibre and dye degradation through photo-oxidation. (Foskett 1994; Rothwarf 1984). Though the thangka is devised to be conveniently rolled for transportation¸ the only method considered to be respectful (see dharmapala Fig 14), it is a source of physical and mechanical damage. Rolling compresses and abrades the surface and abrasion is aggravated when the cover is missing. Neither is it an easy task to roll it with all its different components and more so if it has distorted. Moreover, the various components of the thangka rarely have the same composition or thickness. Consequently, when it is rolled, the pressure is unequal on all the parts. This results in unequal stresses, which partly explains the occurrence of folds and creases. And these folds and creases are destructive because they form areas of weakness. Like many things, size does matter and huge thangkas are at higher risk of such damage (Agrawal 1984; Blyth-Hill 1992; Dharmapala Centre, Huntington 1970; Mehra 1970; Shaftel 1986). Earlier repairs that were inappropriate, are failing to serve their purpose, or are degrading have also contributed to the deterioration of thangkas. Case study 11 illustrates such a condition. The adhesives were failing in several places, causing overall inadequacy in support. (Agrawal 1984; Foskett 1994). Unfortunately, as with most damage, it is also not easily undone (Shaftel 1991). Pests can cause severe damage to thangkas. Animal pests such rats and birds can physically attack thangkas for food or nesting materials or soil them with droppings. Mould grows easily on cellulosic fabrics, decomposing them and the attack can easily spread to other textiles (Timar-Balazsy and Eastop 1998). Telltale signs of mould damage include musty odour, presence of black or white powdery growth, yellow or multicoloured stains, and condensation. Missing parts are quite common in thangkas, too. Often the veils, ribbons and mountings, or rods are lost. Some possible explanations are that they were discarded when they become severely deteriorated and were not replaced. But there are also times when they were intentionally removed. The mounting may be removed to enable transport out of the country. Dealers or collectors or the museum could have also removed them for particular reasons (Agrawal 1984; Gupta 1994; Shaftel 1998). These issues consequently influenced the choice of treatments (approaches). The study revealed that conservators have taken on various treatment approaches. These different treatments had their purposes, some of which will be presented shortly. They will also be assessed on their risks and benefits to the material and conceptual integrity of the thangka. In some approaches, the constituents are separated to faciliate large-scale cleaning and/or lining. Prior to separation, a detailed sketch or document (including measurements) was done. And at the end of the treatment the thangka would be stitched together once again (Agrawal 1984; Mehra 1970). The stitches were removed (Cases 6,7) (Agrawal and Misra 1991). The stitches were cut but left in position as evidence of the original material and method of construction (Bacchus 1999). They were stitched using the same type of stitches as the original (Agrawal 1984). The purpose was to remove damaging and disfiguring repair on the thangka and its lining. By doing this, re-stitching of vulnerable areas could be done. Couching was minimal because it may cause surrounding threads to break. Direction of couching was in the same direction as when the thangka would be rolled, ensuring no tension is caused (Bacchus 1999). Repair stitching, being more intrusive, was limited (Bacchus 1999). It is assumed that conservators will use the original stitch holes where they are visible and can be used. Method 2 reflects a greater awareness of retaining material and conceptual integrity. Once again, assuming that the thread used in conservation is fine (in terms of diameter), it hopefully will not greatly affect the stitch holes and consequently the strength of the overall structure. However, taking the thangka apart is quite unlike taking apart a LEGO construction. In the latter, one can be confident of the reassembly but unfortunately not so for the thangka. It is a formidable task that demands manual dexterity, good judgement in tensioning, and experience (Heady 2001). The type of stitches and the extent of stitching needs to be well thought out because errors could result in splits, weave distortion and creases (Bacchus 1999; Rothwarf 1984). Nevertheless, the use of stitches in general will be a comfortable option on the basis of maintaining material and conceptual integrity because the thangka was constructed using stitches. Cleaning can improve the aesthetics of the thangka and aid its interpretation, which may be difficult when dirt accumulates. Besides, removal of soiling facilitates good contact and bonding between the silk and support in the adhesive treatment. It will also reduce the risk of further soiling penetration into the silk during humidification. In practice, spot tests are carried out with different solvents and solutions to ascertain the most effective and least harmful and intrusive chemicals for reducing the surface soiling and water damage (Agrawal 1984; Mehra 1970; Goldman 1992). Mottled discoloration, tide lines, stains were reduced/removed using a combination of solvents with the aid of the vacuum suction table. The suction table tackles the moisture sensitivity problem of thangkas (Cases 2, 4) (Blyth-Hill 1992; Foskett 1994; Goldman 1992). Dust, dirt and oil were cleaned with an aqueous mixture of organic solvents like water and rectified spirit (6:4), trichloroethylene and rectified spirit, with or without ammonia; 5% triethylamine in rectified spirit, or toluene, benzene, trichloroethylene (1:1:2). More complex ones include 0.5% carboxymethylcellulose and 1% neutral detergent labolene with pH adjusted to 8.5 using sodium bicarbonate; 5% paste of carboxymethylcellulose in distilled water with a few drops of ammonia (Cases 6, 7, 9, 10). The cleaning solvent may be applied using an indirect process. The thangka ia sandwiched between tissues of blotting paper onto which the cleaning mix was applied. This type of application has dual purposes. Firstly it facilitated dirt and accretion absorption onto the tissue paper and secondly it pressed the loose bits in place (Cases 6, 7, 9). A soft brush was used to remove surface dust and dirt (Case 10) (Gupta 1994). Dyes that are fast in water have been washed in a detergent solution in enamel trays, inserted between layers of nylon gauze. A flat brush is then worked on the surface to remove dirt and other accretions. To remove soot, a 2% solution of triethanolamine in ethanol was used and 1,1,1-trichloroethane was used as a grease solvent. After which they were rinsed in clean water, dried between sheets of blotting paper and then allowed to dry (Agrawal 1984). For dyes that are not fast to water, dry cleaning methods have been used (Agrawal 1984). The veils were sprayed with IMS:deionised water (1:1) in sections. The liquid and dirt were removed by blotting or sponging where the accumulation was thicker and the veil was straightened while wet (Liverpool Conservation Centre 1997). Cleaning will help to remove harmful soils, which may be disfiguring or cause physical or chemical damage. But cleaning is irreversible. The nature of the accumulation must first be established. There may be spots and marks left by sandalwood paste and roli used for rituals. Therefore whether ethically it should or should not be removed must be considered (Lister 1996). For one, they form a part of the life history of a thangka and as such, it is desirable that they remain. For that reason, some conservators have chosen to clean only the reverse. However, if the coverage is too obtrusive, at least partial removal may be necessary (Agrawal 1984; Bacchus 1999; Mehra 1970). Equally important is the need to bear in mind and to judge to on aesthetic grounds when to stop cleaning. Cleaning must also be done with caution as eliminating too much dirt or deterioration product, may weaken the mechanical properties of the thangka and hasten its disintegration (Timar-Balazsy and Eastop 1998). Hence its effect on the material and conceptual integrity has to be weighed. The main aim of humidification is removal/ relaxation of creases and folds relaxation. The thangka was placed between Goretex and damp blotters with light pressing (Case 4). The thangka was gently humidified between large sheets of Goretex andinserted between damp blotters. It was then flattened between polyester and blotters (Case 8). Area was covered with damped Aquatex moisture vapour permeable material and weighted with glass (Liverpool Conservation Centre 1997). Area was sprayed with deionised water, weighed down and dried with a cool hairdryer (Liverpool Conservation Centre 1997). Creases distort and therefore increase the risk of fibre weakening. Through humidification MI is therefore managed. Humidification also maximises the points of bonding for adhesive treatment. And it restores CI by reducing the distortion and thus improving the interpretation of the thangka (Bacchus 1999; Lister 1996). There is an increasing interest in marrying conservation methods with traditional preservation methods. In the life of a thangka, the mountings have been replaced when they were worn (Bacchus 2001). The same artist should preferably do any restoration because there should not be a mixture of paint mediums, unless the restoring artist is certain of the original paint medium. Each artist has his own style of painting and each tradition has its own colour scheme and motifs. The artist must know all the traditions and colour schemes in order to undertake any restoration. Touching up of some damage paint may be possible but if the extent of damage is large, it will be difficult. It would be cheaper to commission a new one using the old one as the template (Singapore Philatalitic Museum 2001). The awareness of traditional preservation methods can contribute to the conservation of the artefact, in particular its CI. Though the aims of both traditional preservation and modern conservation may differ, there is a good possibility that it will benefit the conservation of the artefact at the end of the day. Method 1 informs us that not all mountings were intentionally removed for the purpose of trade. So if one can qualify that for the thangka presented for conservation, it can justify to a certain extent recreation of new borders where they are missing or beyond stablisation, for the purpose of restoring CI and to enhance appreciation of its original presentation. At the same time, method 1 suggests that original borders are hard to come by and therefore the curatorial decision to remove the border in Case 4 has actually greatly compromised CI. With the knowledge of traditional preservation methods, the conservator can strive to find a conservation approved alternative to it. This could maintain CI and MI. The whitish layer of fungus was treated by the application of a 1% orthophenyl phenol in ethanol (Case 8). The thangkas were fumigated with paradichlorobenzene (50g/m3) for a week (Case 9). The treatments eradicate pests to prevent further damage to the thangkas. But there is increasing awareness on the implication on health and safety and environmental concerns when planning pest eradication programmes. These should be safe for the artefact, the personnel involved, and the environment. When the original support/fabric of the components is too weak, brittle or torn, unable to serve its purpose, relining/supporting has been done. General specifications include that the relining/supporting fabrics should not hide the magical formulae and ritual inscriptions written on the thangka. This has been achieved by cutting small windows, at appropriate places in the new support (Agrawal 1984; Mehra 1970). The support fabric is also preferably sympathetic to the original fabric and should be of adequate weight for support. And before relining is undertaken, it is recommended that old patches or bad repairs be removed. The new supports (relining/ reinforcement) have been achieved using stitched and/or adhesive support. Where required, overlays have been incorporated to protect loose threads on the surface and reduce further loss from abrasion (Bacchus 1999). The use of silk thread as it can be dyed, is strong, and is sympathetic to the original (Foskett 1994). Sandwich between nylon net using minimal support stitching with monofilament silk (Rothwarf 1984). Overlaying with polyester netting (Case 5). The weakened area is lined with silk and reinforced by couching across the damage. In more severe cases, it will be sandwiched between a silk lining and a crepeline overlay using stitches (Liverpool Conservation Centre 1997). Weakened border was sandwiched between silk crepeline using running stitches. Areas of splits and holes were reinforced by extra stitches around them (Liverpool Conservation Centre 1997). Sometimes, however, the fabric may be too fragile to be stitched. In such situations, the adhesive method has been employed (Bacchus 1999). The attachment by heat of a terylene or nylon net impregnated with PVA emulsion. Casemment cloth was used as lining and a paste of wheat flour, water, orthophenylphenol and glycerine, as adhesive. A full back support of Khadi polyester cloth was given to the entire thangka (Case 9). The insertion of a PVAC adhesive (MowilithDMC) coated nylon net support between the silk borders and the lining (Case 11). Destarched markeen cloth using maida paste as an adhesive and with minimum moisture. The specially prepared adhesive kept the painting flexible after the lining (Case 10). A backing of cotton cloth with fine wheat flour paste adhesive was used (Case 6). One of the benefits of relining is that it strengthens and supports the thangka. It also gives opportunity to secure loose embroidery from further loss, to reposition the loose fragments, recouch slits and to resecure separate borders. This not only restored the picture composition but also retained the original evidence and location (Bacchus 1999). A key concern about relining has been its impact on the original nature of the thangka. The thangka is meant to be flexible and capable of rolled storage. And some conservators feel strongly that this should not be impaired (Agrawal 1984; Mehra 1970). Furthermore, the choice of adhesive and the use of adhesive techniques are complex issues for the conservator. Although the adhesive may be reversible in theory, it may not be possible without some loss or damage. Some damages include impressed folds, soiling as a result of continuous tackiness at room temperature and adhesive transfer (Foskett 1994). The dulling of colours as a result have also been reported (Shaftel 1991). But sometimes it is a choice between irreversible treatment or loss of object (Hillyer, Tinker and Singer 1997; Masschelein-Kleiner and Bergiers 1984). MI and CI are largely in conflict. Certain losses can disrupt one's ability to interpret the thangka or appreciate it. Ethically loss compensation and/or total replacement has been done to safeguard the design or the form of the art. It aims to preserve the significance and values that have been diminished by losses. This is where conceptual integrity takes precedence over material integrity (Bakkar 1993; Kronkright 1993; Leavengood 1993; Pye 2001). Missing parts were filled by lining with a similar fabric of similar texture and weave from the back (Cases 1, 6, 9). The losses at the corners and edges of the painting were compensated with fabric from thangkas saved from prior projects. These were shaped to fit the areas of loss and adhered into position using Japanese paper and wheat starch paste adhesive (Case 8). Where there are areas of loss of the cotton support, an isolating layer of pulped kitakata, a long-fibered Japanese kozo paper has been used because its colour and surface properties were sympathetic to that of the original. It was cast on the suction table, shaped to fit the areas of loss, and fixed using a thin, dry wheat starch paste prior to inpainting (Goldman 1992). Where the border was very weak and fragile, and where half of it is already gone, a new border was provided using textured silk. Missing veils and ribbons were also recreated using silk (Case 9). Faded colours were compensated through the use of sympathetically dyed overlays (Liverpool Conservation Centre 1997). When a rod was very weak or had been destroyed or lost altogether, a new rod, slightly longer than the width of the thangka was made (Agrawal 1984). Conceptual integrity can be jeopardized through graphic compensation. The variety of the iconography makes it virtually impossible for the indigenous Tibetan scholars to extrapolate the information that would be required to fill in losses and that would not put a conservator in any better position to do so (Shaftel 1991). Thus speculation has been strongly discouraged. When loss compensation is requested, it is important to be sure of the way it was made. Equally important is the awareness that the religious and iconographic message must be respected and maintained (Shaftel 1993). The mounting is an inherent part of the thangka. And as it is important both structurally and symbolically, an attempt is always made to save it. It may be possible to ascertain if the current mounting is, in fact, the original by close examination of the edges of the main panel. The presence of several rows of stitch holes can indicate that the mounting has been changed (Shaftel 1998). And when the conservator is faced with a thangka removed from its mounting or requiring a new mounting, several options have been considered (Shaftel 1991). Treatments inclined towards Western-style painting aesthetic such as the removal and discardment of the mounting and replacing it with matting and framing has been done. The mounting intact but the top and bottom dowels have been trimmed and framed. A new mounting, copied from another thangka (Shaftel 1991). Where the borders have been beyond hope, new borders have been created using the original borders as the guide so as to simulate the effects intended and to retain the original concept (Huntington 1970). Remounting the thangka in Chinese or Japanese scroll painting aesthetic. LACMA has numerous examples of thangkas mounted in this way in the late 1960s (Blyth-Hill 1992). An approach back in 1975 (Case 1), was the application of BEVA (two-part BEVA crystals and wax, pre-BEVA 371) and the mounting of the thangka to a honeycomb panel. (Case 3) A Tibetan thangka painter, with specialist expertise in the traditional Tibetan way of making the cloth borders for the thangka was engaged. Suitable fabric, used traditionally, Chinese brocades, silk or cotton had to be used. The colour and design had to match the colours and tone of the thangka they were to surround. When limited in choice, brocades that were not Chinese, but quite suitable in colour and design had to be used. And when a satisfactory colour could not be found a suitable brocade would be dyed. To prepare for the sewing, the central picture was removed from the old borders and measured so that the dimensions of the borders could be calculated to be proportionate to the central picture. The borders were sewn together and thereafter to the picture. Precision and perfection is important. The poles, veil were also made and put in their respective locations. Sewn the central picture of the thangka around the four borders, to a cotton-fabric-covered strainer support. The curator selected the raw silk borders, dyed them to specified blue and were sewn to the edge of of the central picture and gently stretched around the strainer (Case 4). The wood and paper-covered Japanese-style mount Karibari was chosen because it is lightweight and ventilates the structure. Cotton/ poly fleece was stretched over it to prevent slippage and to provide a cushion. A muslin strip lining was adhered to the central picture, using BEVA film, after which the thangka was gently stretched over covered karibari. To recreate the borders, bleached silk was dyed with Lanaset dyes. A thin border of red silk was adhered around the edges of the central picture using BEVA film and its free edges basted to the muslin. The wider blue silk border was hem-stitched on top of the red border (Case 8). The Nelson-Atkins Museum has recreated original mounts with veils shown in lacquer frames or under sheets of plexiglass (Blyth-Hill 1992). Conservators have also mounted thangkas on fabric covered padded supports within a plexiglass box. The original rods were kept in position but with a barrier placed between itself and the silk. The lower rod was positioned such that it no longer weighed down the thangka. The veil was draped in traditional fashion. All the effort was to provide an accurate depiction of its display in its original context (Ennes 2001). In some cases, when the giant thangkas were previously destroyed, new ones were constructed to replace them. Where there was no visual record of the original image, designs were based on oral instructions and guidance of the abbot, in order that it was closely based on its predecessor (Temple and Nguyen 1999). Due to a lack of understanding of the thangka, several approaches have interpreted the thangka in another aesthetic dimention such as methods 1 and 5. The latter interpretation seemed to suggest that there was a generic approach to the mounting of twodimensional Asian arts, which further implied that treatments were based on prior experience with similar objects not necessarily from the same culture (Blyth-Hill 1992). Such intentions are erroneous as the thangka is not meant to be flat like a Chinese scroll. In fact, a thangka removed from its original mounting has been greatly compromised in MI and CI. It has been said that when frames of Christian images were removed, the impression of the images became casual, maybe the same could be said of a thangka (Bakker 1993; Shaftel 1991). Sewing the thangka into a replacement mounting has to be carefully executed. It must be well tensioned otherwise it will cause eventual damage to the structure (Shaftel 1991). Conservators have also reconsidered the recreation of borders largely because there is little research in this area. The appropriateness has to be evaluated as well (Blyth-Hill 1992). There has always been a debate on loss compensation. Ruskin disapproves of it on the grounds that what is lost can never replaced. And some past treatments that have turned bad only serve to justify such sentiments (Leavengood 1993; Darrow 1993). In view of these concerns, loss compensation has been carried out within a framework of restrictions in which there are two basic camps of thought. One camp advocates the use of material different from the original so as not to give the false impression that it is complete as well as to enable differentiation between the two. The other believes that material compatibility is essential. The common goal is to attain compensation that causes losses to recede, and to be appropriately integrated with what remains without falsification. But knowing where and when to stop is subjective and therefore controversial. Dino Dini is one who feels that graphic compensation is essential or else conservators are merely gap-fillers (Darrow 1993; Leavengood 1993; Marks 1993). The aesthetic desired in loss compensation is debatable as well. Often, the context influences the aesthetics desired but it is not good enough to simply preserve according to the aesthetics preference of others. The appropriate aesthetics should be aimed for because the thangka, like all sacred art, requires different aesthetic considerations from those of decorative art (Bakker 1993; Kronkright 1993; Marks 1993). Prevention is better than cure. The factors that aggravate deterioration have been considered and favourable conditions for preservation and measures for protection against future damage have been instigated. Preventive measures for the care of thangkas on display include the following. The use of two thick ribbons, slightly shorter than the thangka, stitched to the ends of both rods on the reverse side of the thangka, to prevent the lower rod from straining the thangka (Case 10). The rolling of the thangka to be done on a flat surface and not in hanging position to minimise creasing, rolling carefully but firmly on the lower rod (Agrawal 1984). The practice of display rotation as opposed to permanent displays, in order to achieve long term preservation. This has been justified on the grounds that it is usual practice in temple or monastery to put the thangka on only on special occasions and that such practice in effect preserved the thangka (Agrawal 1984). The use of showcases to prevent the accumulation of dirt (Agrawal 1984: 270). The use of appropriate lighting and light levels (Agrawal 1984). The provision of handling instructions, condition checklist and display recommendations (Bacchus 1999) such as restrictions on traditional sprinkling of water to minimise the problems (Case 10). Use of inert materials for storage and display. Storage for long-term preservation has also developed with the consideration of the various needs of the thangka. The following are some of the recommendations. Stacking should be avoided, flat storage in its place (Heady 2001). Storage that separates individual thangkas or the usage of individual storage boxes (Agrawal 1984; Heady 2001). At LACMA custom-made boxes with a cotton felt lining to prevent slippage, velcro straps for security, and glassine interleaving between the painting and the veil have been used (Blyth-Hill 1992). From a textile conservation perspective, to roll up the thangka with its back inside will save its front. This is unacceptable from the Tibetan cultural standpoint. The treatment option for eventual rolled storage will have to take this into consideration (Van Der Leeden 1972). Internal form that supports any inherent distortion in shape when in storage (Bacchus 1999). Wrapping in acid free paper or silk and stored in boxes (Fleming 1995). For rolled storage, the surface can be covered with acid free tissue and polyester wadding and rolled onto a soft, fabric covered, padded roller and finally wrapped in Tyvek (Liverpool Conservation Centre 1997). Issues of concern in environmental control have also been highlighted. There has been usage of silica gel and para-dichlorobenzene crystals to control relative humidity and to eradicate pests. The maintenance and establishment of a well-ventilated environment has been recommended as well (Case 10). The treatments/measures that have been discussed may involve undoing previous treatments. Current thinking in conservation reflects a trend towards greater respect for the cultural and historic information represented by the artefacts. Every action should therefore be seriously questioned, as it is an irreversible process and less interventive approaches have been chosen where possible (Windsor 1999). It is apparent that there are various perspectives and approaches to the conservation of thangkas. And it is unlikely that a consensus will be made because of individual subjectivity. Every conservator comes with his/her baggage of knowledge, sensitivity, interpretation, training and experience (Brooks 1998; Keyserlingk 1998; Silveira 1998). 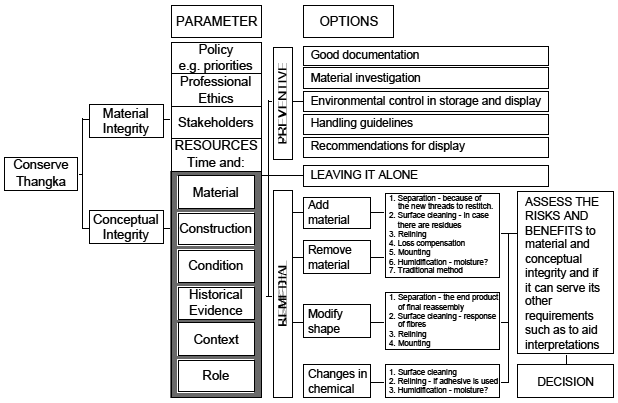 Conservators have a framework for decision-making. Their differences lie in the choices that they have opted for on the grounds that the choice decided was appropriate for the thangka placed in their care. The framework for decision making, that will be presented, was conceived upon the completion of the research. It is illustrated in Fig 2 & 3. Fig 2 spells out several concerns in thangka conservation. One of which is that conservators place great emphasis on the preservation of the material and conceptual integrity of the thangka. Their concern has been influenced as well as constrained by a variety of parameters including professional ethics, condition and context. Fig 3 highlights some specific questions pertaining to these parameters. A conservator should strive to find answers to specific questions such as these because they would lead to information that substantiates the material and conceptual integrity of the thangka. In doing so, conservators will be able to make informed decisions. Hence it is by using the parameters to their advantage that conservators can formulate treatment strategies that could be preventive, remedial approaches, leaving it alone or a combination of approaches. But at the same time, the conservator needs to fully understand the nature of the treatments and in particular remedial treatments. Conservators have to assess the implication of each specific treatment that is the risks and benefits to the material and conceptual integrity of the thangka. The conservator will also have to ensure that the outcome of the treatment is desirable, in terms of long-term preservation and meeting the needs (parameters). The framework therefore can be interpreted in two directions, from the left to the right of the framework and vice versa. This is because in decision-making, the numerous issues involved are actually inter-related. The thought process in decision-making should therefore involve a constant feedback mode (Bakkar 1993; Keyserlingk 1998; Kronkright 1993; Pye 2001). with ethical respect to world heritage? What is the condition of the border, cover, ribbons and rods or are they missing? Is loss compensation required? Is the fabric strong? Does it need strengthening through support/relining? Is it in its original form? Identify the type of stitching used. The risks and benefits of thangka conservation treatments have been assessed on a very rudimentary level in this research and it can only highlight the existence of certain concerns. It has been suggested that treatment strategies be clarified through the use of management tools such as decision trees. One advantage of decision trees is that it calculates the risks and benefits, facilitating decision-making based on a numerical value. This is very useful when conveying conservation-preferred strategies because numbers simply makes sense to most of us. The disadvantage of the decision tree however is that it is mathematical in nature, involving probability figures that are not easily established (Caple 2000; Pye 2001). Artificial intelligence decision-making support systems (DMSS) have been instigated to help conservators. Marcon has published his paper on the model for preventive conservation (Marcon 1997). Some others are currently under construction. DMSS are not unique to conservation and it exists in the medical profession, too (Marckmann 2001). If DMSS is accessible by convenient means, such as the worldwide- web, and is continually updated, it serves as timely information to support decision making. It will be a useful reference, but the ultimate treatment option still depends on the conservator. Setting priorities is also important and cannot be underestimated in decision-making. Not only is it useful in organising work, it rationalises work actions and put problems and worries into perspective. It helps one to see what is the important thing to do. For instance when time is not on your side, it may be better to consider what is the most important treatment that the artefact need, what is the minimal that can be done to ensure its survival until the day when more time can be allocated to its care. On a larger scale, it can evolve into a strategy for managing time and resources. Such long term planning helps to balance the realities and constraints of deadlines and resources. Surveys of thangkas have been carried out in the Horniman Museum and Gardens and the Los Angeles County Museum of Art. They have created the opportunity to establish procedure for the examination of the museum's thangkas and to prioritise the need for conservation (Batton 1992; Heady 2001; Pye 2001; Talley 1999; Waller 1994). The findings from this research confirm that there are various perspectives and approaches to the conservation of thangka. This variety is largely due to the involvement of numerous issues in the process of decision-making. It has been recognised that a consensus is unlikely because the issues themselves are also variable in different geographic locations and in different times of history. The complexity of this decision-making process has been expressed in a framework that was established based on these issues. The framework emphasises the need to be conscious of the interrelationship between these issues. One of the important issues underlying decisionmaking is interpretation of the significance of the thangka. Each conservator, coming from a different background, will have his/her own interpretation. The context and the role of the thangka also affect its significance. And it is important to acknowledge these differences. For instance, in an art gallery approach, thangkas may be presented without their borders (which may have been intentionally removed or have been missing since the acquisition) while in a historic museum, efforts may be put in to recreate the borders in order to approximate the original presentation. Though the latter have taken into consideration conceptual issues, it should not result in the former approach being considered culturally or ethically inappropriate. This is because this choice of presentation is typical of an art gallery and this is probably their policy. Moreover there does not seem to be immense pressure for them to change their approach. So unless there is greater awareness and the establishment of ethical standards in the handling and treatment of thangka, it will otherwise remain. This development of ethical standards in the handling and treatment of thangka can be achieved with the assistance (where possible) of a member of the cultural or religious group (Greene 1992). Often, such interests in a the conservator surprises the group because they have never been queried on how others should take care of their sacred objects (Bruce-Gardner 1988; Heady 2001; Thompson 1998). But this should not be interpreted as a conservator being overly concerned. It is important to convey that regardless of personal beliefs, the conservator's wish to treat the sacred objects of the Tibetan culture in ways that respect them and will not to offend them (Mellor 1992; Reedy 1992). It is also crucial to have an informed interpretation of the thangka. The research has shown that each thangka is different. Each possesses different significance because each was created for different reasons. This cannot be overlooked. A generic approach to thangkas as sacred art is inappropriate because some of them were not created for the purpose of religious use. Therefore it is important to establish the original context and role of the thangka in order that an appropriate treatment is carried out. Of the treatments that have been carried out, there is obvious concern about loss compensation. It has been and can be done in minimalist fashion using sympathetic and reversible materials. It has been suggested that where possible, however severely deteriorated the original fabric is, every effort is made to stabilise and strengthen it and not to remove it. In cases where borders were missing and new ones need to be recreated, it has been recognised that this must be based on informed decisions because the wrong choice of colour or proportions is inappropriate. And having studied the various approaches, the author would like to suggest the following approach in recreating new borders. It involves firstly mounting the central picture to a large suitable fabric support. New borders are then stitched onto the support, close to but not onto the four sides of the central picture. This will be reversible and will achieve a complete presentation of the thangka. This is not interventive. It will minimally affect the material integrity of the thangka and can restore the conceptual integrity to a certain extent without falsification to the next generation of conservators. Re-creation as such is not an absolute need. The display setting and/or use of informative text can be equally effective in facilitating the interpretation and appreciation. If a chair is no longer a chair once it is in a museum collection and therefore cannot be sat on, how about the thangka in the museum context? Treatments of thangkas in museum context do not justify loss compensation or any other treatments, unless the believers confirm that it is desirable or otherwise disrespectful to their beliefs. A museum has to consider several issues if it wants to build an intimate relationship with a religious group. For instance, a museum in Singapore may have on display several pieces of religious art, from different religions. The handling and treatment of religious art have to be dealt with sensitively because in a multi-faith society, religious harmony is crucial to the stability of the country. Ensuring that religious art is treated with the same level of respect, and to the appropriate level desired by the believers has to be taken on board. And if the sacred art can continue its religious function, it maybe more appropriate to actually return it to its sacred house. Conservation can always continue to play a role in their preservation. The approach will just have to be different from the museum context. Though conservation cannot bring a thangka back to its original state because it will change even if gradually in material, aesthetics and signficance, the intervention of conservators is necessary. This is because one of the responsibilities of conservation is to safeguard the thangka for posterity (Leavengood 1993; Marks 1993). Therefore conservators must continue to learn about the thangka because one should always know what one is doing and why one is doing it – that is the value of conservation. Learning is a formidable task and more so when dealing with a culture that is remote in time and/or place. But we should take heart that there is always much more out there to learn and there is no end to learning. So it is unnecessary to fret if we do not know everything, as long as we do it within our ability. A Nepalese thangka, Caitya, from a private collection was mounted to the sturdy honeycomb panel using BEVA (because of its reversible properties as well as its gentleness on the thangka as opposed to starch paste which would have required moisture and mechanical action on the delicate water-soluble materials). The losses were filled using materials similar to the original and graphic compensation based on information provided by what remains on the thangka. The conservation treatment was carried out after consultation and communication among conservator, curator and the owner (Blyth-Hill 1992). The thangka, A Chandra Mandala (ca. 1424), damaged across the top edge and brittle was remounted on a sturdy honeycomb panel using BEVA. It was the museum's standard then to have raw silk borders added in order to facilitate an understanding of the concept of a complete thangka. Loss compensation was done in minimalistic fashion, by filling areas with darkened fabric of similar weight and weave (Blyth-Hill 1992). Keeping the surface flat was the most important aspect of the treatment, a trend thought to be directly paralleled to painting conservation practices of the same period. A large portion of the museum's collection of thangkas had deteriorated to the extent that the fabric disintegrated at a touch. Some of them came to the Museum without cloth borders. The notion was that the thangkas could not be exhibited in such condition. Hence, when planning for display, reframing was essential. A Tibetan specialist was therefore engaged to carry out the necessary restoration in traditional Tibetan fashion, including borders, veils, ribbons and the rods. The ultimate aim was to enable a better and a more conceptually accurate, appreciation of thangkas, as Tibetans have seen them, with bright colours and in traditional framing (Williamson 1983). The thangka A Symbolic Banquet (18th century) had losses, creasing, flaking and problems for transport and display. The textile curator had requested the removal of the extremely deteriorated border on grounds that it was not original or of the same period as the picture. Although this was not desirable approach from a conservation standpoint, the borders were removed. However they were stabilized and retained with a cross-reference identifying them to the thangka. The surface was cleaned, creases were removed, and loss compensation was also carried out. The "less is more" approach was taken. The treatment was carried out in collaboration with textile conservator. The thangka was stitched mounted on a fabriccovered strainer and borders were recreated using silk. The aims were to provide overall support, softer presentation, not rigid like honeycomb (Blyth-Hill 1992). This late 17th century silk applique Tibetan thangka was complicated by the presence beneath the fabric backing of a stitched lining and several layers of inscribed paper, which had been sewn in place in the same operation as the appliqué elements to the face of the thangka. The inscriptions' interest to scholars necessitated the paper be removed for study. This procedure was carried out by a paper conservator. The increased frailty of the newly unlined thangka determined its subsequent treatment to be mounted as a flat textile rather than to attempt to recover its scroll-like character. Other treatment included wet cleaning on a suction table and overlaying badly abraded appliqué areas with polyester netting (Arden, Hutchision 1988). The thangka had endured structural and surface damage. The main aim of the treatment was therefore stablisation. To carry out the treatment, the thangka was separated into 3 parts, namely the central picture, the borders and the veil and the ribbons. The course of treatment included cleaning and relining, to give support to the fragile thangka and loss compensation. A cloth backing as reinforcement was also given to all 3 parts. Finally all the separated parts were joined by stitching (Agrawal and Misra 1991). The priority of this treatment was the borders and the veil which were in fragile condition. They were brittle, torn and had numerous losses. The treatment involved the removal of the old stitches and separating the central picture and the veil from the border. After which surface cleaning was rendered using tested solvents. The missing areas in the border were filled using a new black silk stitched support. The washed veil was reinforced by stitching a yellow muslin cloth backing. When strengthened, these parts were attached stitching and finally a full back support of cloth was give to the thangka (Agrawal and Misra 1991). The conservation of Akshobhya Buddha in his Eastern Pure Land of Abhirati was through a collaboraton of several conservation specialists and curators. The aims of the treatment of the thangka were to put it in a condition fitting to the museum's collection strategy and to prepare it to meet various exhibition demands. The preliminary testing and analysis to identify materials, before-treatment condition report, and treatment proposal were carried out. The treatment attempted to balance the picture composition by cleaning lightly overall. As the object was not flat due to the environment and the fact that it had been rolled for an indeterminate amount of time, it was gently flattened. Areas of tears and losses were to be mended and filled, and minor cosmetic work through inpainting were undertaken. Inpainting helped to make the missing areas legible. As the cotton support was weak and heavily damage, the thangka was finally supported on an adapted Japanese-style drying board (a karibari). The goal was that the thangka appear as much as possible to be a hanging composite painting/textile object rather than a flat work of art. New borders were added to approximate the original presentation (Goldman 1992). The collection of thangkas were in fragile and in fragmentary condition. Besides pollution damage, the textile fabric and wooden rods had suffered pest problems. The thangkas were therefore fumigated. After which borders were separated from the central picture and consolidation, surface cleaning and repairing ensued. The new support was then made and adhered to the thangka using an adhesive, wheat flour paste. The final reassembly was done by an expert and a full back support was provided for as well as a preservative coating (Singh et al. 1992). Auxillary support (borders, rods and veil) was missing. The thangka was structurally weak and the surface has deteriorated. It was cleaned using dry and wet methods. The old adhesive at the back of the thangka was removed with sand paper and by other mechanical means in order to make it rough for lining (Gupta 1994). The course of treatment incorporated consolidation, facings to keep the torn edges together, neutralization of the cloth that had become acidic and relining of the weakened support. Large lacunae were filled using markeen cloth with starch paste so that it remained slightly below the surface level. The restored areas were toned down using colours. Several preventive measures were introduced one of which was the use of ribbons to bear the weight of the hanging thangka. Guidelines for display and storage such as the removal of sprinkling of water were instigated (Gupta 1994). The painted thangka was treated in 1977. The aim of the current treatment was to remove both the adhesive and stitched treatments that were failing to adequately support the textiles and were aesthetically displeasing. The adhesive treatment was also creating damage through adhered creases and dirt pickup. The thangka was expected to return to rolled storage. The adhesive support was removed using heat and mechanical action. Each textile component was then stitched onto a suitably dyed fabric support. Overlays that were suitably dyed, semi transparent were used where necessary to prevent further damage. The treatment approach was based on sympathy in texture and colour to the original, unobtrusive principle, adequate strength for the required purpose, and distinction from the materials used in the past. The treatment provided support, improved structural stability and enhanced the appearance without any attempt at recreating the original (Foskett 1994). Case Study 12: 1999 in U.K. The conservation strategy was to marry the objectives of long term preservation of material and historical evidence and facilitation of access for study with the respect for the thangka's traditional function. It was achieved through several means. Firstly, through the use of a combination of adhesive and stitched support. Secondly the derivation of a partially rolled storage. Thirdly, the reduction of creases and distortions and strengthening and supported to facilitate safe handling. Fragile areas were also supported. An internal form was also devised for the upper border to support it as it returns to its threedimensional curved shaped (Bacchus 1999). I would like to thank firstly the National Heritage Board of Singapore for the sponsorship to do my Masters in Principles of Conservation. Many thanks, too, to conservators who have provided me with information. Dinah Eastop for introducing Helen Bacchus, Helen herself for the wonderful sharing of her experience and some of the treatments that have been done at the Liverpool Conservation Centre, Teresa Heady for a rewarding discussion, Anne Ennes and Debbie Ward. I am also grateful to Elizabeth Pye and Clifford Price for an enriching programme at the Institute of Archaeology, that has stimulated me greatly. My immense thanks, to Dean Sully, who has been a wonderful and understanding supervisor. Thanks to him for the thought provoking discussions and for pushing me to my limits. Special thanks to all my friends for their support, especially Alasia, Elani, Renata, Robin, Shirley, Suat Ngoh and James Hales, for always being so kind and helpful. My greatest thanks are to my family. I thank them for their understanding of my absence and for standing by me through it all. Agrawal, O P, 1984. Conservation of Manuscripts and Paintings of South-East Asia. UK: Butterworths. Agrawal, U and Misra, M, 1991. 'Conservation of Thanka – Two Case Studies,' Conservation of Cultural Properties in India, 86-69. Alsop, I, 1992. 'Modern Traditional Painting in Nepal,' Western Association for Art Conservation, 15, 15-30. http://www.asianart.com/waac/index.htm 28 July 2001. Arden L and Hutchison B, 1988. 'Treatment of a Silk Applique Tanka,' In: S Z Rosenburg (ed), The American Institute for Conservation of Historic and Artistic Works, Preprints of Papers Presented at the 16th Annual Meeting, New Orleans, Louisiana, June 1-5, 1988. USA: American Institute for Conservation. Asian Arts a. 'Baiya Mural Conservation.' http://www.asianart.com/cers/baiya.html 31 Aug 2001. Asian Arts b. 'Conserving Tibetan Art and Architecture. Project Overview.' http://www.asianart.com/cers 31 Aug 2001. Bacchus H, 1999. 'From Private Meditation to Public Access. The Conservation of a Rare Chinese Embroidered Thangka.' Unpublished Diploma Thesis, Textile Conservation Centre. TCC Ref: 2495. The V&A accession number 1479. Bacchus H, 2001. Personal communication with Bacchus, Textiles Conservator, The Conservation Centre, National Museums and Galleries on Merseyside, in September 2001. Bakker, K, 1993. 'Aesthetic and Cultural Considerations for the Conservation of Hispanic New Mexican Religious Art,' In: P Leavengood (ed), Loss Compensation Symposium Postprints, Western Association for Art Conservation Annual Meeting 1993, 33-39. USA: Western Association for Art Conservation. Barton G and Weik S, 1994. 'The Conservation of Tapa,' The Conservator, 18, 28-40. Batton, S S, 1992. 'The LACMA Tibetan Thangka Research and Survey Project: Micro To Macro,' Western Association for Art Conservation, 15, 15- 30. http://www.asianart.com/waac/index.htm 28 July 2001. Bhowmik, S K, 1965. 'Conservation of a Thanka Painting in the Collection of Baroda Museum,' Journal of the Oriental Institute, 14, 404-409. Blyth-Hill, V, 1992. 'The History of Thangka Conservation in Western Collections,' Western Association for Art Conservation, 15, 15-30. http://www.asianart.com/waac/index.htm 28 July 2001. Brooks, M M, 1998. 'International Conservation Codes of Ethics and Practice and their Implications for Teaching and Learning Ethics in Textile Conservation Education,' In: A Timar-Balazy and D Eastop (eds), International Perspectives in Textile Conservation, 74-80. London: Archetype. Bruce-Gardner, R, 1988. 'Himalayan Scroll Paintings: Conservation Parameters,' The Conservator, 12, 3-14. Caple, C, 2000. Conservation Skills, Judgement, Method and Decision Making. UK: Routledge. Clavir, M, 1994. 'Preserving Conceptual Integrity: Ethics and Theory in Preventive Conservation,' In: A Roy and P Smith (eds), Preventive Conservation: Practice, Theory and Research Preprints of the Contributions to the Ottawa Congress, September 1994, 53-57. London: International Institute for Conservation. Commoner, L A, 1992a. 'Warning Signs: When Textiles Need Conservation,' In: K Bachmann (ed), Conservation Concerns A Guide for Collectors and Curators, 85-90. U.S.A.: Smithsonian Institution Press. Conservation Online. 'Ethical Issues in Conservation.' http://palimpsest.stanford.edu/bytopic/ethics 8 Sept 2001. Cooke, W D, Babakham A and Hillyer L, 1996. 'The Cleaning of Degraded Linen, Part I & II,' The Conservator, 20, 3-14. Cussell, S, 1998. 'Different Methods or Different Choices?,' In: A Timar-Balazy and D Eastop (eds), International Perspectives in Textile Conservation, 108-110. London: Archetype. Darrow, E, 1993. '"Necessity Introduced These Arts" Loss Compensation in the History of Compensation,' In: P Leavengood (ed), Loss Compensation Symposium Postprints, Western Association for Art Conservation Annual Meeting 1993, 7-12. USA: Western Association for Art Conservation. Dharmapala Centre a, School of Thangka Painting. http://www.bremen.de/info/Nepal/Icono/category/Pri nt1.htm 28 July 2001. Dharmapala Centre b, School of Thangka Painting, 'Handling of Thangka Covers.' http://www.bremen.de/info/nepal/Icono/cover.htm 28 July 2001. Eastop, D, 1998. 'Decision Making in Conservation: Determining the Role of Artefacts,' In: A Timar- Balazy and D Eastop (eds), International Perspectives in Textile Conservation, 43-46. London: Archetype. Ennes, A, 2001. Personal communication with Ennes, Associate Conservator, Textile Museum, Oct 2001. Fleming, W, 1995. 'Eastern Pictorial Art,' In: S Bradley (ed), A Guide to the Storage, Exhibition and Handling of Antiquities, Ethnographia and Pictorial Art, 89-93. UK: The British Museum. Foskett S, 1994. 'The Re-Conservation of the Top Border of a Thangka.' Unpublished Diploma Thesis, Textile Conservation Centre. TCC Reference 1838.8. Goldman, J, 1992. 'Akshobhya Buddha in his Abhirati Heaven: Treatment Report,' Western Association for Art Conservation, 15, 15-30. http://www.asianart.com/waac/index.htm 28 July 2001. Greene, V, 1992. '"Accessories of Holiness": Defining Jewish Sacred Objects,' Journal of American Institute of Conservation, 31, 31-39, http://www.jstor.org/stable/3179610. Gupta, C B, 1994. 'Technique & Restoration of Thankha Painting – A Case Study,' Conservation of Cultural Property in India, 27, 160-165. Heady, T, 2001. Personal communication with Heady, Deputy Head Collections Conservation and Care, Horniman Museum and Gardens, Oct 2001. Hillyer L, Tinker Z and Singer P, 1997. 'Evaluating the Use of Adhesives in Textile Conservation: Part I An Overview and Surveys of Current Use,' The Conservator, 21, 37-47. Himalayan Art a. http://www.himalayanart.org/image.cfm/87210.html 6 Sept 2001. Himalayan Art b. http://www.himalayanart.org/image.cfm/132.html 6 Sept 2001. Huntington, J C, 1970. 'The Iconography and Structure of the Mountings of Tibetan Paintings,' Studies in Conservation, 15, 190-205, http://www.jstor.org/stable/1505582. Jensen, U J, 2000. 'Cultural Heritage, Liberal Education and Human Flourishing,' In: E Avrami and R Mason (eds), Values and Heritage Conservation, Research Report, The Getty Conservation Institute, 38-43. Los Angeles: The Getty Conservation Institute. Keyserlingk, M, 1998. 'Moral Dilemmas in Textile Conservation,' In: A Timar-Balazy and D Eastop (eds), International Perspectives in Textile Conservation, 47-49. London: Archetype. Kronkright, D P, 1993. 'Compensation for Deterioration Resulting in Losses: A Structuralist Looks at Old and New Practices for the Conservation of Ethnographic, Archaeological and Contemporary Objects,' In: P Leavengood (ed), Loss Compensation Symposium Postprints, Western Association for Art Conservation Annual Meeting 1993, 13-18. USA: Western Association for Art Conservation. Leavengood, P, 1993. 'Loss Compensation Theory and Practice: A Brief History,' In: P Leavengood (ed), Loss Compensation Symposium Postprints, Western Association for Art Conservation Annual Meeting 1993, 1-5. USA: Western Association for Art Conservation. Leoshko, J, 1992. 'The History of the Art History of Tibetan Art,' Western Association for Art Conservation, 15, 15-30. http://www.asianart.com/waac/index.htm 28 July 2001. Lister A, 1996. Guidelines for the Conservation of Textiles. UK: English Heritage. Marckmann, G, 2001. 'Recommendations for the Ethical Development and Use of Medical Decision- Support Systems.' http://www.medscape.com/medscape/GeneralMedici ne/journal/2001/v03.n…/mgm0620.01.marc-01.htm 8 Sept 2001. Marcon, P J, 1997. 'Decision Support Models for Preventive Conservation,' In: S Bradley (ed), The Interface Between Science and Conservation, 143- 151. UK: The British Museum. Marks, L S, 1993. 'East and West: Approaches to Loss Compensation,' In: P Leavengood (ed), Loss Compensation Symposium Postprints, Western Association for Art Conservation Annual Meeting 1993, 41-43. USA: Western Association for Art Conservation. Masschelein-Kleiner L and Bergiers F, 1984. 'Influence of Adhesives on the Conservation of Textiles,' In: N S Brommelle, E M Pye, P Smith and G Thomson (eds), 'Adhesives and Consolidants': Preprints of the Contribution to the Paris Congress, 2 –8 September 1984, 70-73. UK : IIC. Men-Tsee-Khang Tibetan Medical and Astrological Institute of H.H. the Dalai Lama. http://www.buddhapia.com/tibet/tibetcen/tmai/tmai.html 6 Sept 2001. Mehra, V R, 1970. 'Note on the Technique and Conservation of Some Thang-Ka Paintings,' Studies in Conservation, 15, 206-214. Meinheit, S, 2000. 'A Gift of the Dalai Lama. Tibetan Scroll Returned to the Library.' The Library of Congress Information Bulletin. http://www.loc.gov/loc/lcib/0006/tibet.html 6 Sept 2001. Mellor, S P, 1992. 'The Exhibition and Conservation of African Objects: Considering the Nontangible,' Journal of American Institute of Conservation, 31, 3-16. Nechung Foundation NYC. http://www.nechungnyc.org/tangka.html 30 Aug 2001. Orlofsky, P, 1992. 'Textile Conservation,' In: K Bachmann(ed), Conservation Concerns A Guide for Collectors and Curators, 79-83. U.S.A.: Smithsonian Institution Press. Orlofsky, P and Trupin, D L, 1993. 'The Role of Connoiseurship in Determining the Textile Conservator's Treatment Options,' Journal of the American Institute of Conservation, 32, 109-118, http://www.jstor.org/stable/3179703. Pal, P. 'A Monumental Applique Thangka from Tibet.' Orientations. http://www.kaleden.com/articles/1018.html 30 Aug 2001. Pye, E, 2001. Caring for the Past, Issues in Conservation for Archaeology and Museums. UK: James & James (Science Publishers) Ltd.
Reedy,C L , 1992. 'Religious and Ethical Issues in the Study and Conservation of Tibetan Sculpture,' Journal of American Institute of Conservation, 31, 41-50, http://www.jstor.org/stable/3179611. Rothwarf, M, 1984. 'The Conservation of a Tibetan Applique Tanka.' Unpublished Diploma Thesis. Textile Conservation Centre. Shaftel, A, 1986. 'Notes on the Technique of Tibetan Thangkas,' Journal of American Institute of Conservation, 25, 97-103, http://www.jstor.org/stable/3179514. Shaftel, A, 1991. 'Conservation Treatment of Tibetan Thangkas,' Journal of American Institute of Conservation, 30, 3-11, http://www.jstor.org/stable/3179514. Shaftel, A, 1993. 'Intent, In Tent and Intense,' http://palimpsest.stanford.edu/byauth/shaftel/intent.html 26 July 2001. Shaftel, A, 1998. 'Thangkas – A Mounting Concern,' Textile Conservation Newsletter, 35, 8-10. Shaftel, A 2001. 'Management of Thangka Collections: A Case Study Approach,' In: CAC-ACCR 2001 Conference and Workshop. http://www.cacaccr. ca/abstracts4.htm 31 Aug 2001. Shang-Shung. http://www.cadmasters.at/ssi.at/SSSUSA.htm 31 Aug 2001. Shechen Institute of Traditional Tibetan Art. http://shechen.12pt.com/finley27.html 31 Aug 2001. Silveira, L D, 1998. 'The Conservation of Two Pre- Hispanic Andean Tunics: Explaining Contrasting Approaches to Conservation Treatments,' In: A Timar- Balazy and D Eastop (eds), International Perspectives in Textile Conservation, 53-56. London: Archetype. Singapore Philatelic Museum, 2001. Personal communication, Sept 2001. Singh, M, Khare, J and Pandey P K, 1992. 'Conservation of Four Thankas,' Conservation of Cultural Property in India, 25, 35-40. Talley, M K, 1999. 'The Delta Plan: a nationwide rescue operation.' Museum International, 51, 11-15, doi:10.1111/1468-0033.00185. Temple, T and Nguyen L, 1999. 'The Giant Thangkas of Tsurphu Monastery.' http://www.asianart.com/tsurphu/index.html 30 Aug 2001. The New Encyclopaedia Britannica, Micropaedia, Vol. IX, Ready Reference and Index, 15th Edition, 1983, Encyclopaedia Britannica Inc.: USA, 807-808. Throsby, D, 2000. 'Economic and Cultural Value in the Work of Creative Artists,' In: E Avrami and R Mason (eds), Values and Heritage Conservation, Research Report, The Getty Conservation Institute, 26-31. Los Angeles: The Getty Conservation Institute. Thomson, J C, 1998. 'On Restoring Sacred Objects.' http://palimpsest.stanford.edu/bytopic/ethics/ 8 September 2001. Timar-Balazsy A and Eastop D 1998. Chemical Principles of Textile Conservation. UK: Butterworth- Heinemann. Unesco, 1975. 'Conservation in South and South-East Asia.' Museum, 27, 154-212. Van Der Leeden, A C, 1972. 'Ethnographical Textile Collections,' In: Leene J E (ed), Textile Conservation, 225-227. England: The Butterworth Group. Vestergaard, K, 1996. ' Mongolian Thangka Paintings from the 18th and 19th Centuries. Techniques and Use of Materials in Thangka Paintings,' In: Bridgland J (ed) , ICOM Committee of Conservation, 11th Triennial Meeting in Edinburgh, Scotland, 1-6 September 1996 Preprints, 388-392. London: James & James (Science Publishers) Ltd.
Waller, R, 1994. 'Conservation Risk Assessment: A Strategy for Managing Resources for Preventive Conservation,' In: A Roy and P Smith (eds), Preventive Conservation: Practice, Theory and Research Preprints of the Contributions to the Ottawa Congress, September 1994, 12-16. London: International Institute for Conservation. Williamson, L, 1983. 'Reframing Tibetan T'angkas,' Curator, 26, 129-136, doi:10.1111/j.2151-6952.1983.tb00601.x. Windsor, D, 1999. ;Preserving the Historic Document: Minimal Conservation Intervention for 18thand 19th- Century Needlework and Pictorial Embroidery,' In: J Bridgland(ed), Preprints of the 12th Triennial Meeting of the ICOM Committee for Conservation, Lyon 29 August – 3 September 1999, 671-676. UK : James & James (Science Publishers) Ltd.
Wongmo, L R, 1999. 'Pieced and Embroidered Silk Images in the Tibetan Tradition.' http://www.chronotope.com/tibet/ 30 Aug 2001.